When life gets busy and you need time out, no better time-out can arrive in the form of awesome fountain pens. I received 2 fountain pens sponsored by Manu Propria ~ Angular Momentum of Switzerland upon returning from my business trip, and oh did I spend a long time admiring them! I intend to make a review of these pens as well as put one of them up for a giveaway, for my website has reached a milestone of 100,000 views! In fact, it has exceeded 100K and now it stands at around 105K views, which is making me exhilarated. Watch out for details on how you can win one of these pens at the bottom of this post. By the way, even though the pens have been sponsored by Manu Propria, all views expressed in this post are entirely my own (just a disclaimer, so that we all know my post is as unbiased as it can be). For the record, these are the biggest pens I have ever had. Measuring around 17cm long when capped, these cigar-like pens are all handmade, so you will never get the exact same ones anywhere else. “Manu Propria” is Latin for “with one’s own hand”, and it cannot be a more fitting name to this company, where all its fountain pens are made by the artist’s own hands (with a lathe too, of course). 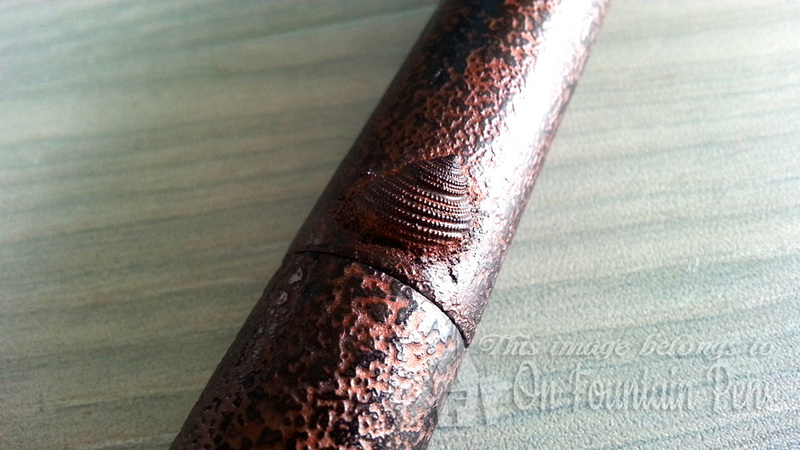 This copper-coloured pen is made for me, as I have selected the “Chado-Nuri” Urushi lacquer technique for my pen. The pen itself is made of black ebonite treated with a layer of black lacquer, followed by an application of transparent Urushi and then fine copper powder. Polishing of a final coat of transparent urushi gives the pen a shiny look with the light reflecting from the peaks and contrasts from the duller crevices of the pen surface. I probably am not doing the fine Japanese lacquer art much justice with my attempted layman’s description of the process, but it does seem like a very complex technique in order to create a pretty piece like this pen. Taking this pen apart you can see it takes a straightforward barrel-section-cap form. The barrel feels sturdy while the cap feels a little more fragile. Well, you can’t expect a pen cap to be as sturdy as the barrel, unless you add some reinforcements to it. I will have to take care NEVER to drop any part of the pen or hit it anywhere by accident. The section fits a regular international cartridge or the converter which you can fill up with ink. The shell is built up with “kokusô” a mixture of urushi, tonoko (clay powder) and rice glue in a technique called “takamaki-e.
Makes it all the more awesome! It looks exactly like a real seashell, who would have thought otherwise? As the pen doesn’t come with a clip, this shell embellishment acts as a stopper preventing the pen from rolling all over the place. A creative, cute, and useful ornament. To accompany this beautiful pen, Martin has included a pen rest and a pen pouch. The pen rest is nothing I’ve seen before – it resembles very much a branch off a grape vine plane but coated with lacquer. It looks so natural that once again, I was almost fooled into thinking it’s real wood! It’s heavy and sturdy, and there is even a little groove on it where you can rest your pen. According to Martin’s description, it is made of ceramic and also urushi lacquered! The pen pouch is simple in design but the cloth is soft and velvety, reminding me of upholstery in expensive hotel suites. What it lacks is a clasp or ribbon to hole the opening shut and prevent the pen from slipping out, since there isn’t anything inside to secure the pen in place. 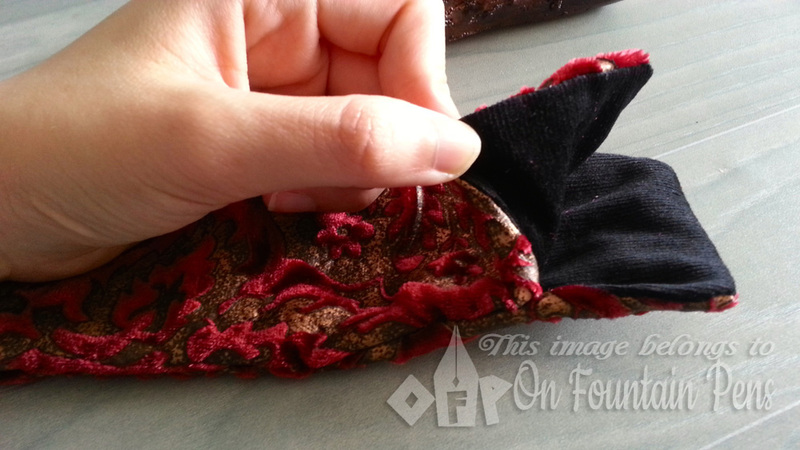 It is very big like the accompanying pen, but the space inside is enough to fit two of the pens inside! Of course it is not advisable to put many pens inside a pouch with no dividers, as they may scratch one another while moving around. You may wonder how this pen writes, but unfortunately I decided not to ink this precious pen for now. For me, this pen is going to be aThe Bock nib that comes with the pen is gold-toned stainless steel, and has some nice engravings on it. I think the pen could do better with a little bit of branding, maybe a logo or an engraving of the Manu Propria brand, as it is not present on the pen, pen rest, or pouch. Now for the exciting part: THE GIVEAWAY! Martin from Manu Propria has kindly sponsored another pen for a giveaway, to celebrate my 100K view milestone. This red pen is a handmade “Tamenuri” type fountain pen. Measuring a length of 16.6 cm when capped, this huge oversized is made of black ebonite as well, and the body is decorated with a technique called “Shudame Sukashi Nuri”. 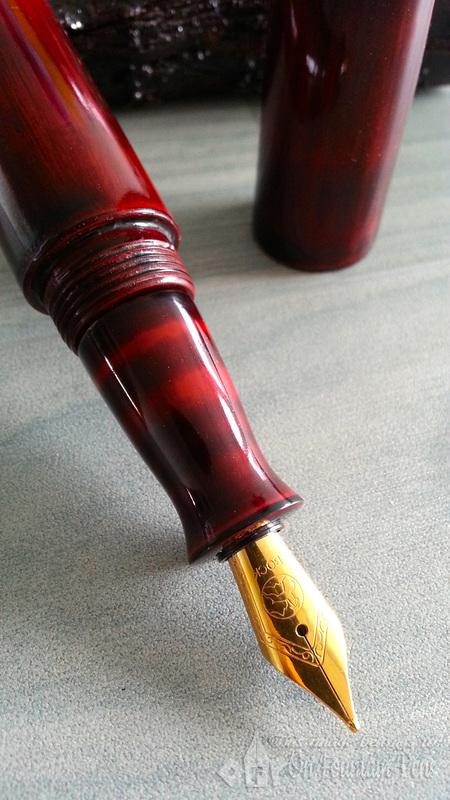 At the bottom is a layer of black lacquer, and then red lacquer is applied on top, giving the pen this red colour. 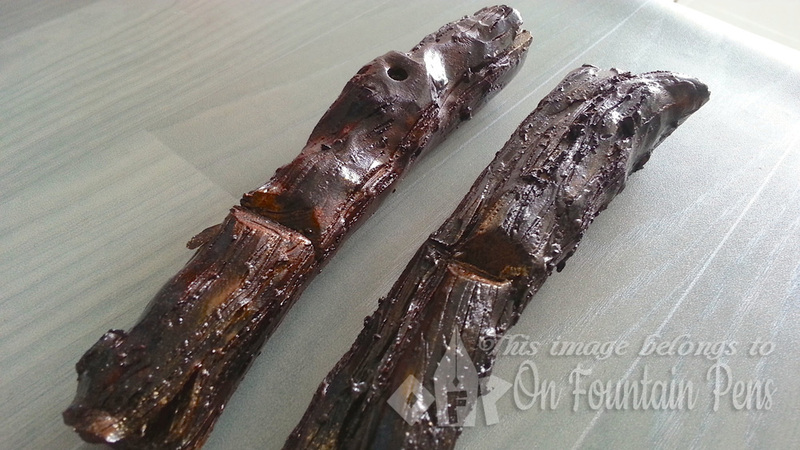 The red lacquer is ground to let the black undercoat show through, then nashiji urushi is applied and polished. Unlike my Chado Nuri, this red pen is glossy and smooth. However it has the same Bock stainless steel nib which is of a golden tone. There is no clip nor any seashell, though. 1. Visit the Manu Propria website http://www.angularmomentum.com/ and browse the collection of fountain pens that are on the site (they have very pretty timepieces too!). 2. Come back to this post and leave a comment telling me which pen you liked best and why. Remember to indicate in the Rafflecopter widget below or your points will not be recorded! 3. There are also optional tasks to increase your chances such as tweeting once a day (for an extra entry per day), liking the Manu Propria Facebook page, and following me on Twitter. Raffle ends 15 April, after which one lucky winner will be selected and announced! Disclaimer: Although the 2 fountain pens have been sponsored by Manu Propria, all opinion on this post are mine. The size itself is unique plus the fact that it combined Japanese materials & technique with Swiss precision and innovation make them one of a kind. A true cross culture product. I like the no 1 and 6 types in Kuro Negoro and Akadama Ishi-Hada. I’m surprised to see such pens created outside Japan. My favorite on the Manu Propri website is No. 15. The look of old bamboo is quintessentially Japanese. I love all the pens I can’t choose one sorry all pens are so amazing !!!! Wow. Gorgeous work, I was sucked in by the watch designs too. I love the No.11 Roiro Kazari Kiseru “Yamimaki” pen. Love the #10 type Shibui Nuri with the stripe look to it. Thanks for the giveaway chance! What gorgeous pens. I like the number 17 but would be proud to own any one of them. 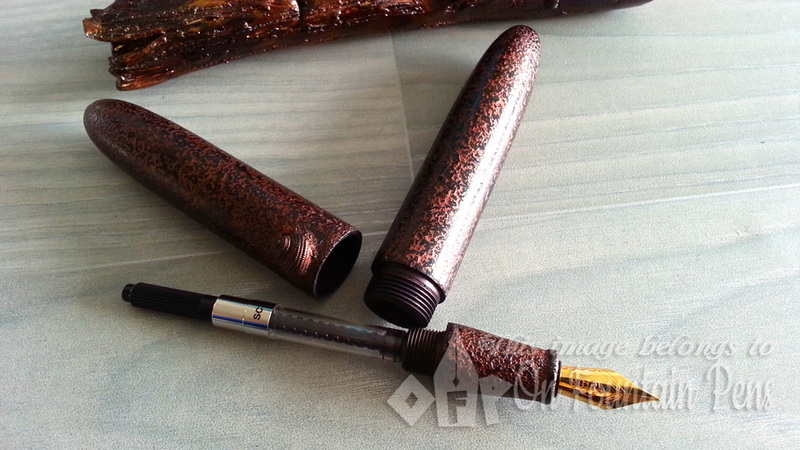 Custom Made Fountain Pens with Urushi Lacquer Finish. The design is named No.8-Type but shape, length and diameter of barrel and cap can vary slightly or be made on demand – I like this one due to it’s elegant simplicity. I love the IroIro Nahiji’s look! Fantastic! #1 Namban Roiro Kawarinuri is fave followed closely by #17 Sitan & #7 Mansuji Nuri. All are stunning pens with depth built up over ebonite by the urushi layers..
Wow what a fabulous giveaway! Such unique pens across the board, I love the no5 type in red lacquer! The Shibui Type III has got to be my favourite. I always liked the minimalist aesthetic, believing beauty comes from the simplest of things. The lean pen body plus the exquisite and understated shimmery finish aligns well with calligraphy, which I consider to be a well restrained but delicate art form. I hope my choice of pen hasn’t hurt my chances for this contest, but even if so, I gotta say Shibui III’s still my pen of choice! I would be thrilled with anything from his website. If I had to pick one it would be a No. 1 I-Kazari Type Tetsumoyô Suzume. It took me a while to navigate the website, but I finally managed to find my way to the pens and even all of the capped and uncapped views for each pen. My favourite is II-Type Roiro. I love its simplicity, the highly polished black ebonite, the understated design, and then the surprising contrast of the threads on the nib section. They are all unique pens, but for me this one is special. I’d love the No.10 Shibui Nuri, with its quite distinctive ringed design… can I get it with a gold F nib? 1) Aka Kinsoku-Mitateai, Model: Aka Tetsu Moyô. For the lovely subtle colour! 2) Unique Piece “Kuramaishi-Hada-Nuri”, Model: Unique Piece Kuramaishi. For the colour and wonderful texture. 3) Ibigawa-ishi hada-ai, Model: I-Type Ibigawa -Ishi-Ji. For the stone-like texture. I love the faux-wood barrel and cap! Gorgeous! Wow, awesome pens! Hope I win! I absolutely adore the Number 6 in Kuro Nogoro Shiage. The colors are tranquil and like it’s lit from within and the shape looks like it would be a dream to write with. I really loved the look of the Namban Roiro Kawarinuri. Quite stunning! The XII-Type Shibui Nuri really caught my eye because of the shape and the texture. It looks simple yet refined. i love the unique pen Koboku Mozô. Because it s unique. 🙂 And the face figure on the cap is awesome. What wonderful pens. I like No. 7 type… of course..one can never pick just one… so I’ll drool over Mansuji Nuri and III-Type – Chadô Nuri. The shimmery texture begs being used. I like the No. 6 – Kuro Negoro Shiage. I’m not a fan of eyedroppers but that color is amazing. Really enjoyed Type 1 Namban Roiro Kawarinuri. It seems that I am looking Jupiter’s clouds. Love, love, love the No. 6 in either the Kuro Negoro Shiake or Iro Iro Nashiji finish. Very beautiful pens! It was hard to pick given that they’re all so pretty. I like No. 11 in the Negoro Kiseru finish. It looks kind of weathered and retro somehow. Beautiful red urushi as well. They’re both absolutely stunning! I would love to have a chance to experience one personally. I’ve only recently begun my FP collection & I am totally hooked. Thanks for introducing me to new pens! I can’t believe I can only pick one! My if have to, it’d be: IroIro Nashiji. Lovely understated elegance; I’m sure I could write some spectacular letters with this beauty. I love the #12…it looks so industrial, like a piece of steel. What a fantastic IV-Type – Kin (Gold) ! Went back to Manu Propria and looked some more. I love the red ones. The best part of this pen is the size. Older writers with a touch of arthritis need more diameter on writing instruments. I wanna one of these: IroIro Nashiji. The under shimmer of gold kissing the red is passionate! All the pens are so beautiful – so hard to choose!! I love the Negoro – the colour is fabulous! I’ve always wanted had one of these! Hi, Maybelline! The fountain pen that caught my eye the most would have to be No. 15 Hon Negoro. I usually go for simple neutral, minimalist designs (whenever I pick anything like cothes), but when I saw the edgy, fiery red with the rustic touch of black- I fell in love. 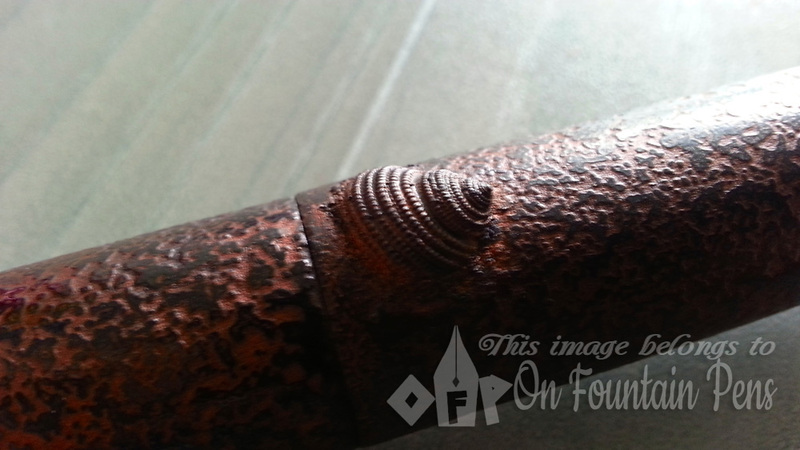 The V-Type – Dô Ishimeji (Copper) has a lovely look. That copper is beautiful. Wow… Never seen these pens before, and now wish I never had. The finish looks so rich! I love getting lost in “swirly” acrylic pens that have some level of translucency. I really like the Nuri lacquer technique. Anyone know if it wears & ages with use? Really pretty pen. (sigh)! Thanks for posting! I dig the snail too! Makes me wish I was more creative with skill to pull something like that off. I am most drawn to the Tamenuri, as I have many red/burgundy inks in my collection that I think will be very handsome with it. The craftsmanship of these pens is mind-blowing. I love No. 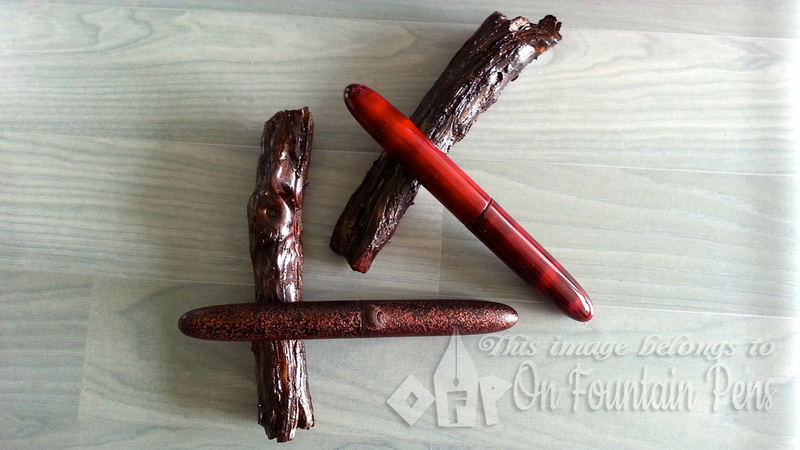 17 – Moku, because the ebonite/urushi combination makes it look like a piece of wood! Reminds me of the work that Sailor did to make an ebonite pen look like a piece of bamboo. I like type 13. The clipless design is appealing, the size and weight of the pen falls into my sweet zone too. 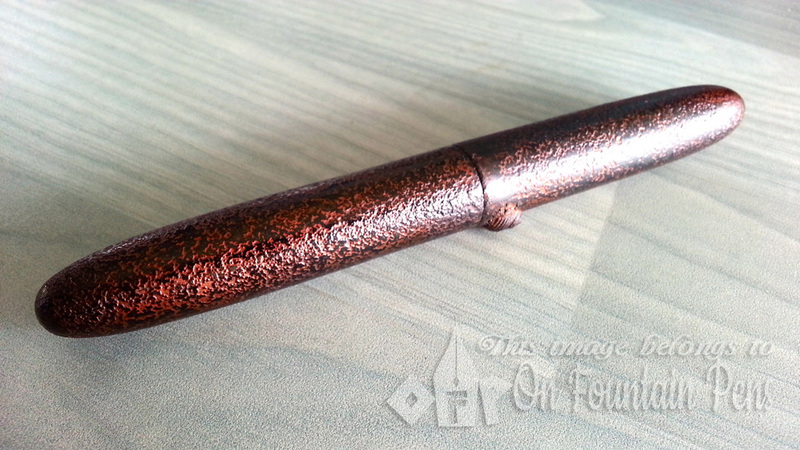 I would request a different urushi finishing on the pen if I order one. There was no ‘like’ or link in the 2nd category to friend Manupropria on Facebook. I looked them up and liked Manupropria Timepieces. I hope that is the correct page. Yes, that was the correct page! Thanks! My favorite is the III-Type – Ume. I love the red combined with the textured finish! I like the the number 11 Namban Roiro Kawarinuri. They’re all beautiful though. It’s hard to choose! the #10 type Shibui Nuri was divine. Love the look of the ridges along the body of the pen/. I’ve fell in love with No.6-Type Fountain Pen – Custom Made Fountain Pens with Urushi Lacquer Finish. Beautiful. Wow, what a stunning give-away, the one that is being offered up looks superb, hope I win!! I like the “No. 6” style pens, particularly the “Picolo Fountain Pens – Roiro Kuro Kinsoku Mitateai.” The rounded, streamlined bullet shape is particularly appealing to me, and I can tell this pen would feel great in my hands. The unique silvery textured finish would be sure to attract envious glances from my colleagues! I like the Namban Roiro Kawarinuri. The contrast is nice, and the finish is shiny and classy. It looks like something that belongs in a museum. The number 3 (Shibui) (favorite) and number 4 are quite nice…there is something future tech about the design yet regal and traditional as well. I like the X-type Shipping Nuri! The ribbed design looks awesome! The No.5-Type with Urushi Lacquer Finish is amazing! Definitely my favorite. Oddly enough, my favourite is actually the one you’re giving away! I would even pick the red colour! I have a Nakaya that is similar, but in a black-red (Kuro-tamenuri, I believe). Thank you for the review and for the change to win! So awesome. It is so difficult to pick out one pen. These pens cry out to be handled. I am drawn to the Do Shibui, as well as Tamenuri. I thank you for a chance to own one of these beautiful pens. I like the #6 in the Iro Iro Nashiji finish. Beautiful. So much depth to it. Kind of reminds me of coals in a campfire.